A quick post for you today of some simple stamped nail art. 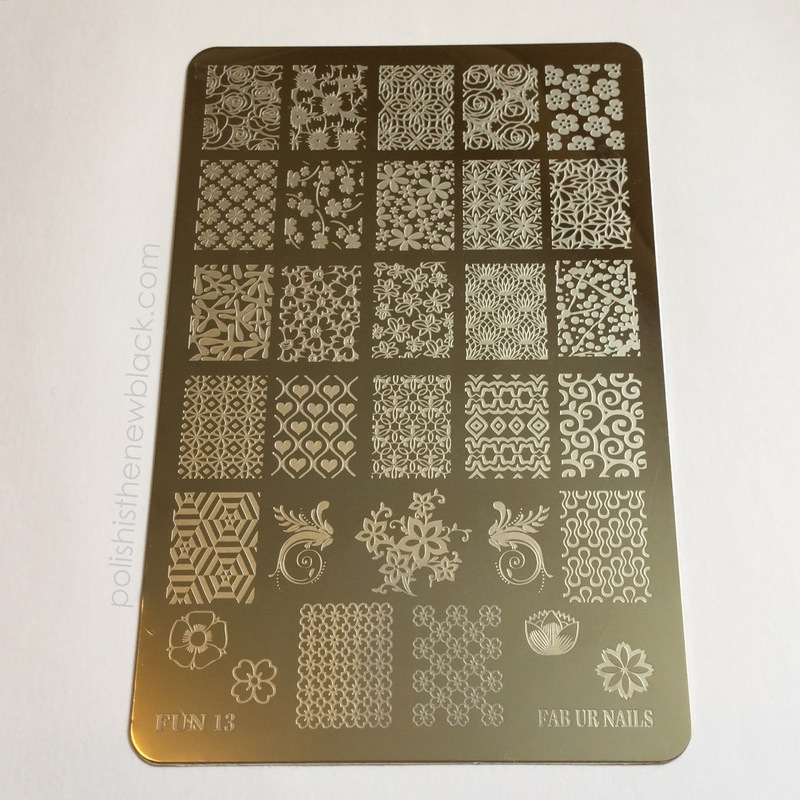 Just before I went away I ordered the FUN 13 image plate and the xl gold stamper by FAB UR NAILS from Rainbow Connection. They arrived the day before I left so I wasn't able to try them out. Anyway the other day I thought I'd have a quick test of of of the images and created this floral design. So the image I used for this design is the 3rd from the right (if you count the single flowers as an image each). Pictured up is the XL gold stamper and I stamped using Moyou London White Knight polish. 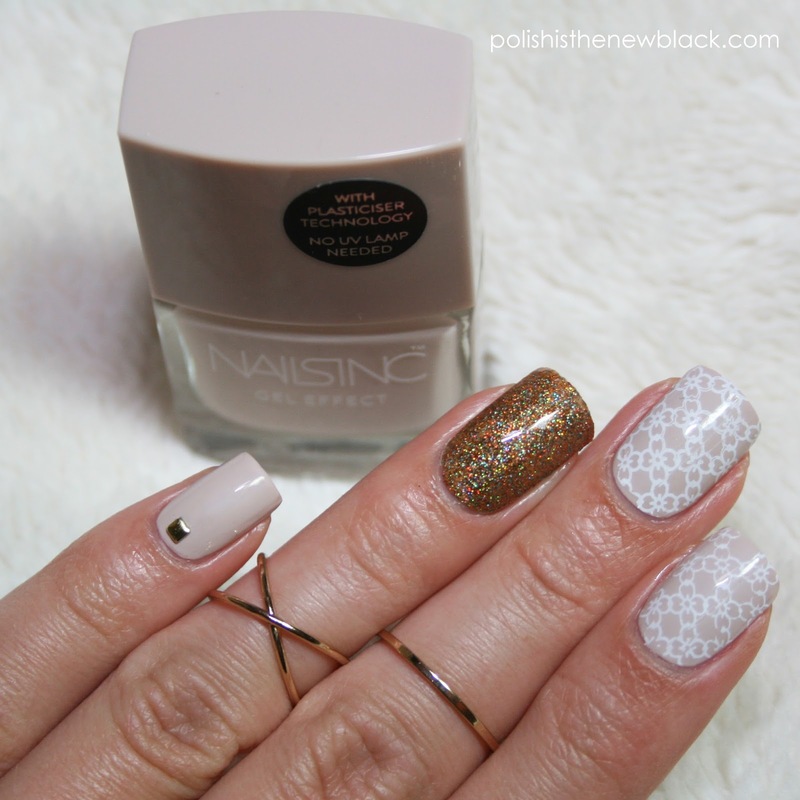 Nails Inc Colville Mews from my June Nailbox read my post HERE. Fab UR Nails XL Gold Stamper £6 and FUN 13 plate £12 from Rainbow Connection. Moyou London White Knight stamping polish. I'm still new to stamping and need to perfect my technique. On my pointer finger I rolled the stamper onto the image plate and onto my nail but with my middle finger I pressed straight down onto the image plate and rolled onto my nail. This seemed to pick up the image a little clearer (the lines are much thicker and the image is more crisp). I didn't prime the stamper at all before use and it picked up the image perfectly. When first trying my creative shop stamper I had to buff it slightly with a magic eraser before it would pick up the images. Practice is definitely key with stamping. I'm going to try somemore stamping nail art soon to perfect my technique but I'm learning stamping is actually more tricky than it looks. I now have 4 different stampers; Konad (a firm stamperwhich I've had for years now I bought it when I was about 14) Moyou squishy stamper, Creative Shop stamper and now the XL gold stamper. I've found each stamper works a little differently and you need to alter how you pick up and transfer the image from plate to nail and apply the right amount of pressure. This was also my first time using BAM! glitter basecoat and it was absolutely amazing! Very happy I made this purchase along with the stamping items. I absolutely love glitter polishes but they are just so much hard work when you have to remove them; you're stuck scrubbing at your nails or soacking them in acetone. Well... not anymore. This base coat literally just peels off! Absolute heaven. Granted you will only get a couple of days wear out of it since it peels off but its that easy you can just re apply. 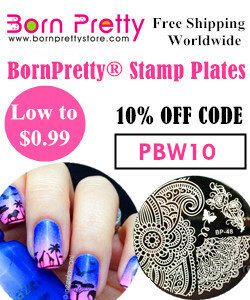 What are your thoughts on stamping nail art?